The move from 27 rue de Harlay to rue de la Harpe is first attested in a letter of Berlioz dated 10 September 1826 (CG no. 64, with a postmark of 11th September), and another letter, undated but in the same context, mentions it explicitly: ‘I have just moved and am now staying at 58 rue de la Harpe, Hôtel de Bourges. Charbonnel is my next-door neighbour’ (CG no. 63). The move will have taken place early in September 1826. The address is last attested in a letter dated 29 November 1827 (CG no. 77 [full text in CG vol. VIII]), but Berlioz stayed there for a few more months till around April 1828, when he moved to 96 rue de Richelieu, the first time he stayed on the rive droite. It should be mentioned that Berlioz’s account telescopes the sequence of events. From the letter of his cited above (CG no. 63) it is clear that Berlioz had already moved in to rue de la Harpe with Charbonnel before he accepted his appointment as chorister at the Théâtre des Nouveautés; in any case the theatre only opened on 1 March 1827 after several postponements. It was during his stay at rue de la Harpe that Berlioz completed his opera Les Francs-Juges by writing the overture (CG nos. 63-65, 70). 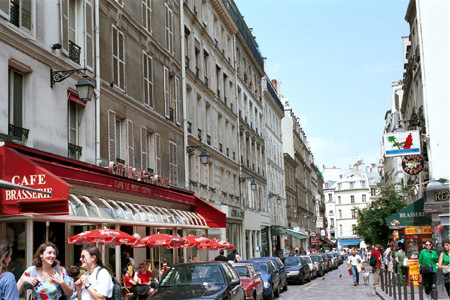 In its present form the rue de la Harpe runs diagonally from the point where Boulevard Saint-Michel meets Boulevard Saint-Germain towards Quai Saint-Michel. But the Boulevard Saint-Michel and Boulevard Saint-Germain did not exist in the 1820s, and the rue de la Harpe was longer than it now is. Berlioz lived at no. 58 from 1826 to 1828 with Antoine Charbonnel, a friend from La Côte Saint-André. There is at present no no.58 in what is left of the rue de la Harpe (photo below), and the street has probably been renumbered. Berlioz’s no.58 may have been located where the Boulevard Saint-Michel now is, facing the Thermes de Cluny (we thank M. Ludart for this information). The modern photograph reproduced on this page was taken by Michel Austin; the engraving is in our own collection. © Monir Tayeb and Michel Austin. All rights of reproduction reserved. This engraving appeared at the time of demolition in L’Illustration, a copy of which is in our collection. 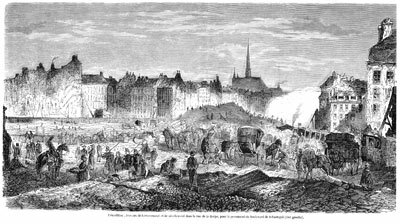 The caption reads: “Démolition, travaux de terrassement et de nivellement dans la rue de la Harpe, pour percement du boulevard de Sébastopol (rive gauche)” [Demolition, terracing and levelling in the rue de la Harpe, for the opening of the boulevard de Sébastopol (left bank)]. The Boulevard Saint-Michel only received its present name in 1867; opened in 1855, it was formerly called the Boulevard de Sébastopol (rive gauche), to distinguish it from the present Boulevard de Sébastopol on the right bank. The latter was also opened in 1855, at first under the name Boulevard du Centre, which was quickly changed to Boulevard de Sébastopol to commemorate the victory in the Crimean War.